I haven’t been in my sewing room much. I’ve been working on a couple of costumes (almost entirely hand sewn while watching House of Cards). I’ll show those when I’m finished (although they’ve been previewed on social media). I’ve also made up a couple of pairs of shorts for pole class but haven’t snapped any photos. It’s amazing how much those scraps of fabric cost to purchase retail! Today I decided to get off my arse and work on a long stagnant UFO. I cut out and started assembly on Simplicity 2645, a denim 3/4 sleeve unlined blazer, ages ago but got bored/overwhelmed and set it aside. 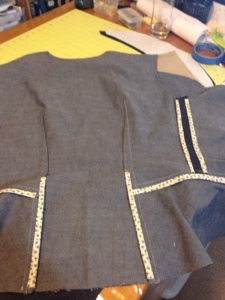 I got a bit further today but decided my patience level wasn’t up to easing denim princess seams or sewing collars. I may do a little more today–this is by no means my only UFO. I’ve pulled out a plaid pencil skirt and a moto-jacket muslin. Step by step I’m trying to be a bit more productive.